A team of academics led by Dr Claire Preston at Queen Mary College have been awarded funding over three years to compile and edit a Complete Works of Sir Thomas Browne which will include not only his major works but also letters and manuscripts which have not been previously published in a coherent way. The Works will comprise several volumes which are being worked on by a team of editors. The volumes will be published as they are finished, with the first expected in 2018. It is a large amount of work which will take 13 researchers several years to complete. Sir Thomas Browne (1605-82) wrote prodigiously on many subjects. He was a very intelligent and well-educated man who had a very curious, polymath mind. The books he wrote covered a range of subjects and recorded his thoughts and experiments. He is also credited with the invention of words such as 'electricity' and many more that are now in common usage and attached to previously unknown concepts. For a 21st century reader, the subject matter and language needs a little perseverance and personally I was helped by interpretive texts such as Dr Anthony Batty Shaw's excellent booklet which outlined the context of Browne's life as well as his work, and more lately, Hugh Aldersey Williams' excellent interpretation 'The Adventures of Sir Thomas Browne in the 21st Century' which has made the understanding of Browne's work so much more digestible for a casual reader interested in Browne such as myself. Religio Medici (1643) outlined the dilemmas for an intensely religious man who also believes in medicine and science and how those two can be squared in the life of a person. 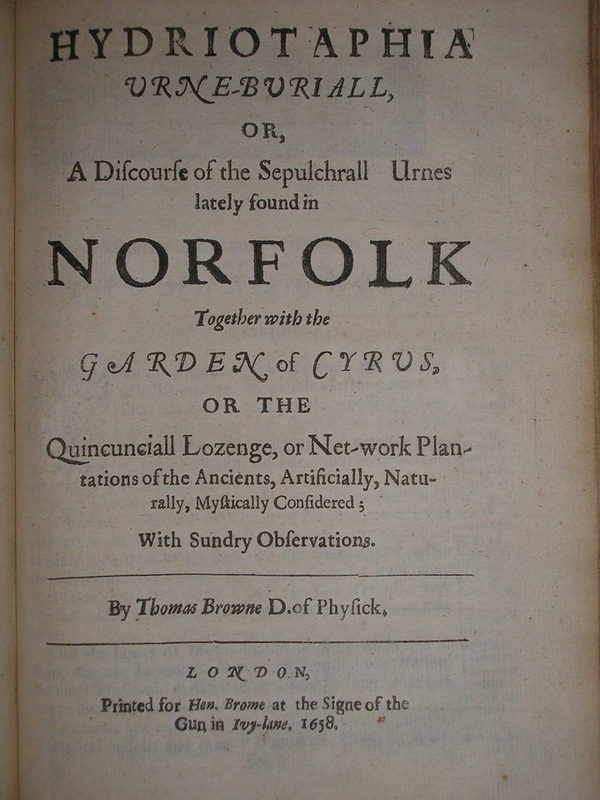 Pseudodoxia Epidemica or Vulgar Errors (1646–72) exposes Browne's breadth of knowledge and curiosity as he seeks to prove or debunk many commonly held beliefs - or as we would now call them 'urban myths'. Through practical experiments, he set out to find out whether you could indeed use a kingfisher as a weather vane, or not and many other equally unlikely propositions!